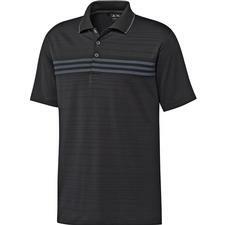 Adidas Climalite 3-Stripes Polo-Black/Lead Z83400 - $24.99 - GolfersEdgeOnline.com - Best Golf Equipment On The Web! To show your poise and determination on the links, try this attractive ClimaChill™ gradient 3-stripes polo. Offers modern design with a gradient 3-stripes print on the chest and ClimaChill™ fabric to help you stay comfortable. If you have any more questions about the Adidas Climalite 3-Stripes Polo-Black/Lead Z83400; do not see the model you are looking for; need custom options; or prefer to not purchase online, then please call us at (630) 656-1291.